The family originated with a 13th century migrant from Weoley in Northfield, now part of Birmingham, at the time when Roger de Somery held both the manors of Campden and Weoley. Richard Weoley was born in Chipping Campden in 1584, coming from a local landholding family of high standing that had lived in the area for nearly 400 years, the first reference being in 1258. A coat of arms had been granted to his ancestor. A monument commemorating Anthony Weoley, younger brother of Richard, can be seen in Barton-on-the-Heath parish church. It refers to Thomas Weoley of Campden, and ancestors at Weoley Hall, Salop. 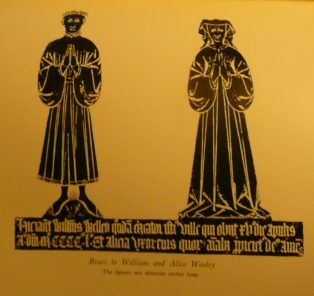 Richard’s 3x great grandfather was an important fifteenth century wool merchant, William Weeley, whose memorial brass showing him with his wife Alice, can be seen in Campden parish church. 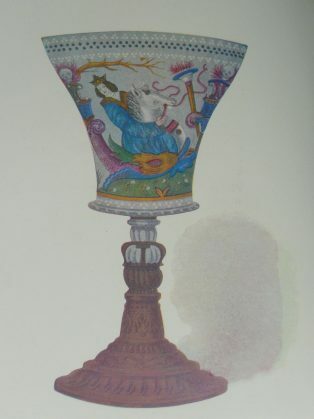 This picture of the goblet is taken from the book about Richard Weoley donated to CCHS by the Founders’ Company. Richard moved to London in 1605 to seek his fortune and was admitted as a member of the Worshipful Livery Company of Founders in about 1610, being elected its Master in 1631 and 1640. The Founders’ Company was an early medieval guild for workers in brass, brass alloys or tinplate, producing small cast articles such as candlesticks, pots and pans. And I do hereby wish that my means were agreeable to my Will, then should they record me a better Benefactor; and I shall ever wish the whole Body may ever live in Unity, Concord, and Brotherly Love, which is pleasing to God and Man. Even thus the God of Heaven Bless Them All. Amen. 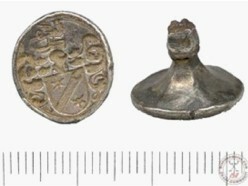 In December 2004 Neil Barlow, a local metal detectorist, found a small personal matrix seal-die fragment in a field near Honeybourne, Worcestershire, and because it was silver it had to be reported as Treasure Trove. The marks on it were of a coat-of-arms showing that it belonged to a rich wool merchant from the Weoley family, likely to be the second son Richard, because of the crescent mark on the bend. Then three years later a most exciting thing happened; still active with his metal detector Neil found the missing piece of this seal – the handle. So the two pieces are now united and held in Worcester Museum. The Founders’ Company commissioned four replicas of the matrix seal from Harts’ Silversmiths of Campden, who have been working for the Founders for over fifty years. 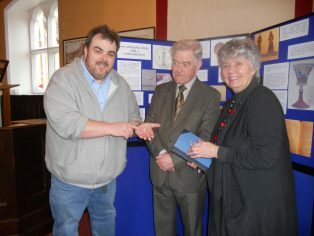 One replica was presented to our Society in March 2013, together with a book of the life of Richard Weoley, written by a former Master. This is because in 2009 CCHS carried out research after we were approached for information about Richard Weoley and his family. Using a variety of sources in the CCHS Archives, our researchers were able to put together a family tree with background information, showing that the Weoleys had been in Campden since at least 1258.